Atomic Games President and former Bungie VP Peter Tamte has taken exception to Bobby Kotick's comment that Bungie is the "last remaining high-quality developer," saying that if he's right, Activision and every other big publisher in the industry is screwed. Activision CEO Bobby Kotick stirred the pot a bit earlier this week when he proclaimed that Bungie, the studio that created Halo and signed a ten year deal with Activision back in April, is "the last remaining high quality independent developer" in the business. Most executives at low-quality developers like Valve, Epic and Gearbox seemed content to let it slide as "Bobby talk," but Tamte most definitely wasn't. "You were quoted saying that Bungie is the last remaining high quality independent developer. As a former executive vice president of Bungie, I need to tell you: If this is true, you're screwed," he wrote in an open letter to Kotaku. "Activision and every other big publisher have grown by acquiring independent developers. The industry needs a constant supply of new independent developers to buy because they're the ones creating innovative games that become franchises," he continued. "Gears of War. Portal. Borderlands. None of these games re-hashes the same old formulas. They innovate. And, they're made by independent developers, of course." Noting that Kotick has in the past referred to Activision as the "industry's online leader," he put forth a challenge: Demonstrate the multiplayer innovation in the soon-to-be-released Call of Duty: Black Ops by selling the online component separately, "for a fair price." 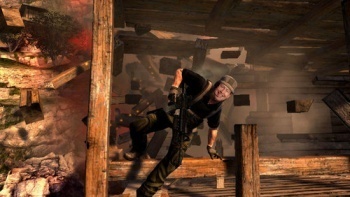 He even sweetened the offer by promising to include Kotick in Atomic's own upcoming online FPS, Breach, which he promised would give the Activision boss "huge street cred." The whole thing sounds a bit silly, an impression reinforced by the mocked-up Breach screenshot that Tamte included with his missive. But Tamte said part of his intent was to demonstrate that while Kotick is apparently limiting his definition of "online" to MMOGs, his company has the opportunity to do much greater things. "Part of our point in challenging Activision to offer Call of Duty's online component separately is we believe there are opportunities to use online both to create new kinds of games and as a means of distribution, like we're doing with Breach," he explained. "Activision could grow the whole industry if it chose to innovate in areas like this." Atomic's Breach is currently scheduled for release in January 2011 for the PC and Xbox 360.